Fantastic project! Your flora shift may not have been caused by lowered SCFAs, but an acidified colon. Meat-charged, acidic chyme of the small intestine where Bacteroides (and lactobacillus) are predominant enter the colon where low pH-sensitive Bifidobacteria/actinobacteria get knocked-off and Bacteroides like B. fragilis assume the throne. During this acid shift, suffering Firmicutes/clostridium produce acetone and butanol instead of the prized butryrate and acetate. Such is the all-meat diet, potentially lowering, not raising colonic pH. thx. plenty of studies have demonstrated an increase in SCFA associated with greater fiber intake. the inverse is seen in meat consumption. note we are talking about pH of stools – some distance from the small intestine. Agreed, I’m playing devil’s advocate stating it’s not about SCFA. There’s conflict about pH sensitivity in meat-associated Bacteroides such as B. fragilis known protective in the last two sections small intestine, jejunum and ileum. So, do they really prefer an alkaline environment? Relatively high acid chyme does enter the large intestine along with Bacteroides where lowered pH affects Firmicutes and Actinobacteria. Meat demands acid for digestion, so that’s the beginning of the chain of events. i guess i’m not following your point. You’re saying your flora shift is due to raising pH. I’m saying it’s due to lowering it. ah, gotcha. 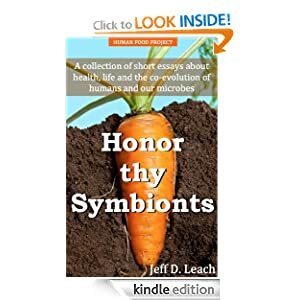 but a considerable amount of research demonstrates that increased fermentation (plants) lowers stool pH. so, reduce the plants/fermentation, SCFA production drops off and pH begins to rise. again, talking about stool pH. i think you might be talking about things a little higher up the ol’ pipe 🙂 — thanks for the exchange, u always raise good points! I just have a hunch this is more about the meat than reduced SCFA from low fiber intake. Thanks for considering, cya ’round town. thanks. but no hunch needed, lots of data support stool SCFA/pH correlates with bugs that metabolize dietary plant polysaccharides et al. Let’s sell this as a meat story, not a plant story. It’ll get a lot more play that way. Think of the headlines. Meat damages gut flora. These Bacteroides are antibiotic resistant mofos prone to translocation. Sure they have purpose, but they’re also virulent. The message remains about plants: eat the hell out of them. It’s about the meat, Jeff. Aside from pH and increased oxygen affecting firmicutes are N-nitroso compounds formed in the ileum and large intestine via bacterial interaction associated with colon cancer. I’m not sure how these carcinogenic compounds, found to increase three-fold in several meat consumption studies, affect sensitive firmicutes. It’s probably not been studied. Your explanation for the flora shift is an important side dish. From health, environmental and humanitarian perspectives, Earth is screaming for a plant-based diet. Instead, you believe it’s about rapid competitive exclusion via pH shift toward alkalinity. Do clostridium clusters really lay down their arms so quickly? Or are they being demolished by toxic compounds, microbial metabolites of meat, especially red meat? Please pardon the multiple posts; just getting thoughts together, learning aloud. Sweet data. I wonder if you tracked body composition during or at least pre/post change. New reader, so forgive if you’ve addressed it. A recent biome hacker myself (with the guidance of a good friend who’s spent years studying the subject).